You want stupid? I’ll give you stupid. 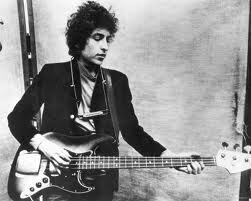 So it’s 1965, and I have been besotted by Bob Dylan for most of the past year. He’s to appear at Massey Hall, backed by a Yonge St. rock band known as Levon and the Hawks, who would later morph into some group called The Band. This is during Dylan’s historic tour after he’d “gone electric” at that July’s Newport Folk Festival, his bold, uncharted and incredibly controversial move that changed everything in music. The first half of the concert was to be acoustic, the second would include Levon Helm and the boys — all destined for the lovely, intimate concert space of Massey Hall. Click here for a remarkable interview with Dylan the next day. But did I go? Ohhhhhh, no. Mr. High-and-Mighty Me was boycotting Dylan for “selling out”, for giving into crass commercialism by strapping on an electric guitar and abandoning his powerful protest songs. I still can’t believe what an idiot I was. Rarely a month goes by that I don’t think of and regret anew my stubborn, brain-dead decision.Adding to my idiocy was the fact I hadn’t even listened to the “new” Dylan. 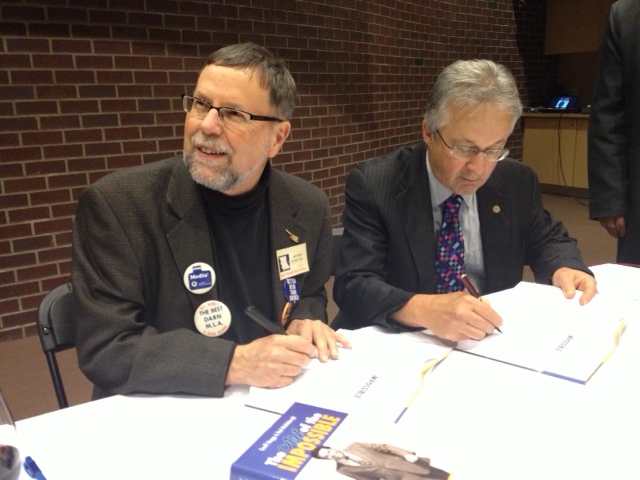 That didn’t happen until 1966, when I had a summer job washing dishes at a UBC dining hall. A fellow dish-washer, tired of my ranting about Dylan, kindly offered to actually play Bringing It All Back Home for me. Off we went to his rented room. The evening was unforgettable. From the first thrilling notes and words of crazy, raucous Subterranean Homesick Blues, to the last lingering tones of It’s All Over Now, Baby Blue, I was stunned. I had no idea. A year too late, but amid the company of so many others, the album totally transformed my musical life. I rushed out to buy it, then the even more ‘electric’ Highway 61 Revisited with, in Dylan’s memorable phrase, its “wild mercury sound”. I played them over and over, analyzing the lyrics to death with fellow ‘Dylan freaks’. The Shakespeare of our age has been part of my life ever since. Yet Bob had to start somewhere, and, as we all know, he boarded his rocket to fame as a young, scruffy folk singer. Which brings me to Inside Llewyn Davis, the latest in the ongoing, prodigious output of Joel and Ethan Coen. 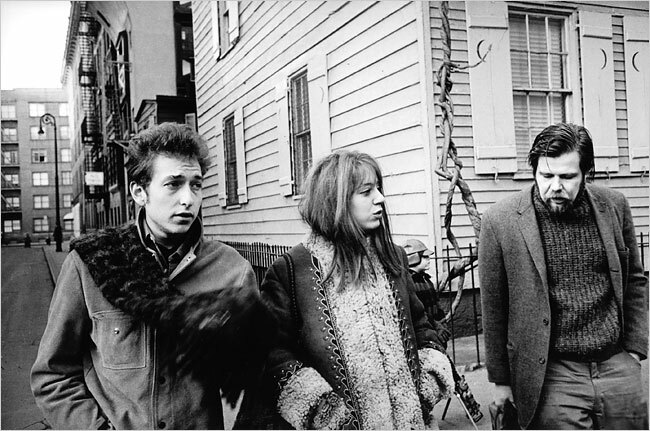 The movie tackles the early 60’s folk scene in Greenwich Village. As with most films by the Coen brothers, it’s very well done, on the surface. They do a good job capturing the look and feel of that long lost but pivotal era, just before folk singers hit it big, particularly those who wrote their own songs. Even better if they penned protest ballads. A few months after the movie seems to end, Dylan tossed off Blowin’ in the Wind, and the music business was never the same. Sadly, however, like so many movies by the talented brothers, Inside Llewyn Davis lacks a heart. Davis, brilliantly played by Oscar Isaac, is mostly a jaded mediocrity with little star quality, who manages to disguise whatever love he may once have had for folk music. The Coens seem more intent on re-creating a time in America, only to mock it with sardonic detachment. Yet their movie is set on the cusp of one of the most fascinating times in American musical history. Why feature a guy on the fringes, with few redeeming features, other than concern for a wayward cat? Plus, I hate the fact that reviewers persist in saying that Llewyn Davis is based on Village folk singer Dave Van Ronk. It’s not. There are a few tidbits taken from his entertaining autobiography, but Van Ronk was never a scuffling dead beat like Davis. He was big, at least in folk music circles. 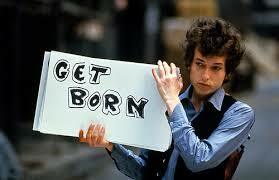 At one time, Dylan said his only ambition was to be as “big” as Dave Van Ronk. Here’s a fascinating take on the movie by Terri Thal, Van Ronk’s wife at the time. My view will be much in the minority, since the Coen brothers are such great film tacticians, seemingly incapable of making a bad movie. They, themselves, have expressed the hope that Inside Llewyn Davis will inspire others to discover the great folk music of the past. They have might have done better driving others to the sounds of those good old vinyl discs by making a movie that was less sour and more heartfelt. Yet I do thank the brothers for returning this aging folkie, at least, back to the music he loved so much as a callow, know-it-all youth. The last few days have been full of mellow nostalgia. The superb, late film critic Roger Ebert touched my soul today, when I happened on his brilliant review of The Dead, one of the most bittersweet movies ever made. 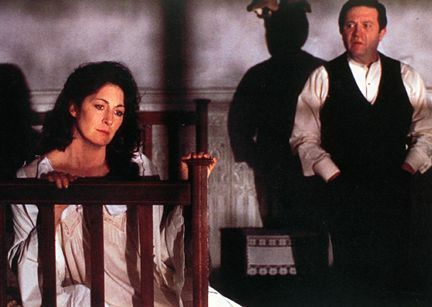 It was a faithful recreation of what is arguably James Joyce’s best short story. Poignantly, it was also John Huston’s last movie. He died not not long afterwards, at the age of 81. My mother adored James Joyce. In the 1960’s, she took a graduate course on Joyce from the celebrated Marshall McLuhan at the University of Toronto. When the movie came out in 1987, we went together. At the end, we sat in silence, caught up in the spell Joyce and Huston had managed to create. There is no action in the movie. It is all dialogue and caricature, with a concluding revelation that leads to one of the most famous end passages in English literature, which Ebert reprints. I read those same words over my mother’s grave on a bleak January afternoon in 2009. Click here for Roger Ebert’s deep, perceptive review. It’s wonderful. Eight-five years ago this week, my mother, then a wide-eyed 8-year old, arrived in Vancouver. It was the end of an exhausting journey that brought her, two siblings and their mother all the way from the west coast of Finland – first to Sweden, then by boat across the stormy Atlantic to Pier 21, and finally, five days traversing this vast, wintry country by train. Leaving friends and family behind, they had come to join my grandfather, who had gone on ahead to earn some money in the logging camps. Speaking not a word of English, they were met at the CPR’s grandiose train station by my grandfather’s sister. Aunt Gerda took them up to the Patricia Hotel on East Hastings, where she was working as a chambermaid. That’s where they spent their first few nights in Vancouver. So the century-old hotel holds a special spot in Mickle lore as the starting point for the long, hard slog by my mother’s family to forge a new life in a new land. And, if you wander in off the street today, you will still find not a bad effort to preserve the trappings of the way the hotel lobby might have looked to my mother that memorable morning in late December, 1928. All of which serves as a very round-about, personal introduction to Jazz at the Pat, one of the best regular happenings in this sometime dreary city. Every Saturday afternoon, from 3 to 7 p.m., top Vancouver jazz musicians bring the Patricia Hotel’s venerable bar to life with their high-quality, straight-ahead musicianship. 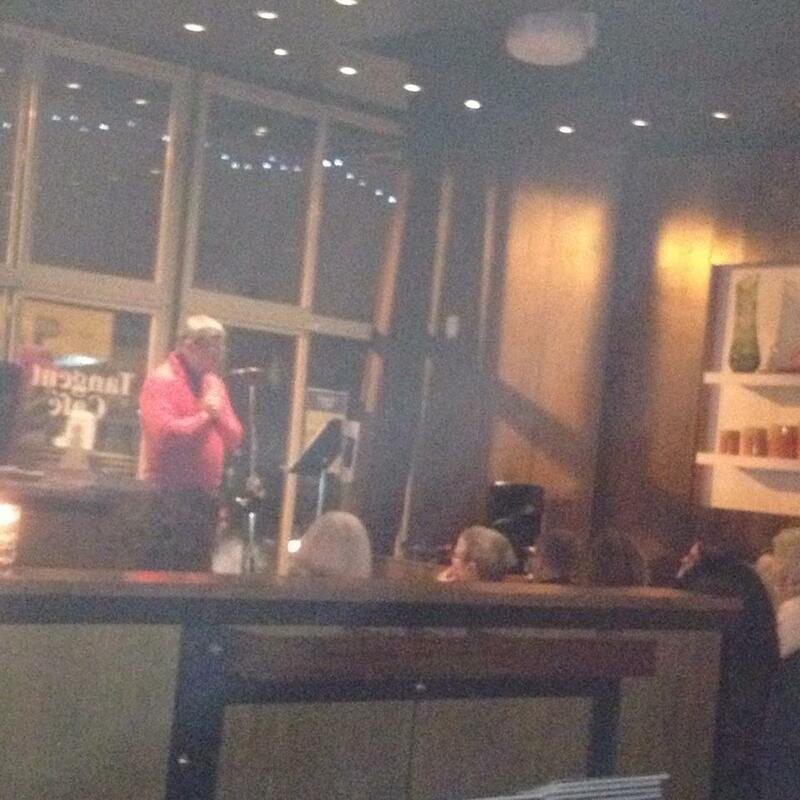 Jazz at the Pat is the best bargain in town – no cover, cheap beer, and great jazz. A real treasure. I try to pop down at least once a month, and have never failed to be enthused. Plus, for me, there’s the added fillip, especially during those long, soulful sax solos, of letting my mind wander back through all that family history. 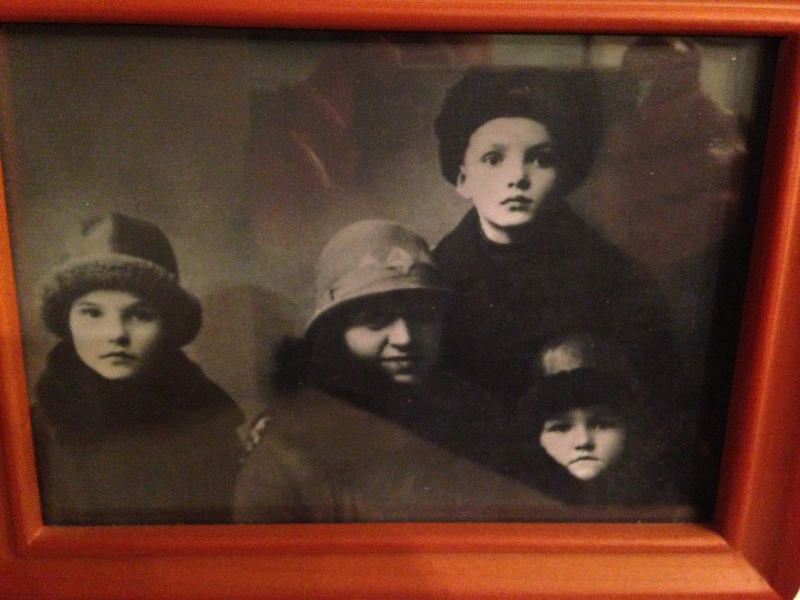 My mom was here in 1928. Now, I’m here in 2013. I like that. 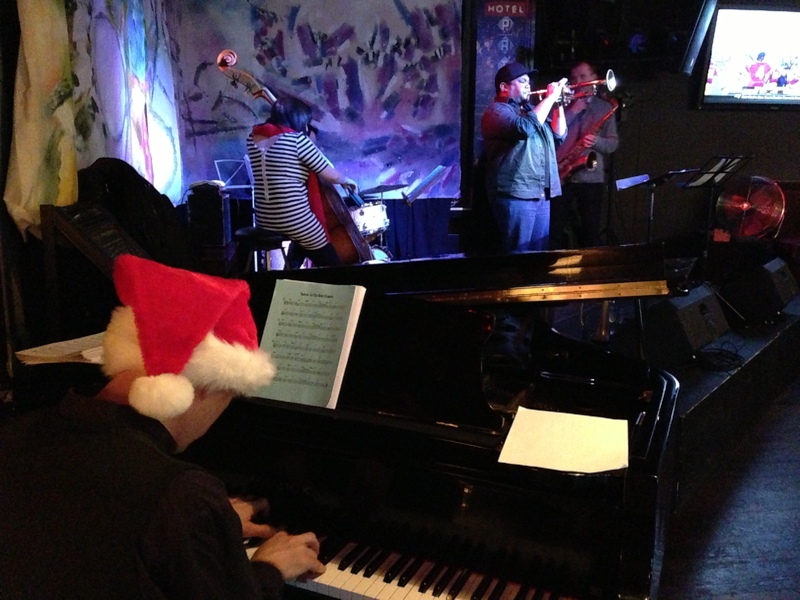 Last Saturday featured some terrific, Christmas-themed jazz, led by trumpeter Chris Davis, with the nimble Jodi Proznick on stand-up bass, Steve Kaldestad on good old sax, drums (didn’t get the name), and the splendid, Santa-capped Miles Black on piano. All superb musicians, they got the last few days before Christmas off to a swinging, Yuletide start. This is a satisfying gig for the musicians, too. With the Cellar Jazz Club soon to close its doors, the city’s many fine jazz artists are having an increasingly difficult time finding paying places to play. I’ve already heard such well-known musicians as saxophonist Campbell Ryga and trombonist Hugh Fraser strut their stuff at the Pat. Do yourself a favour. Get down to the Pat any Saturday afternoon. Guaranteed to be a good time, and you can’t beat the price. Besides, it’s not as if jazz is new at the hotel’s bar. None other than the legendary Jelly Roll Morton, touted by some as the inventor of jazz, was resident pianist there from 1919 to 1921. You can look it up. I realize this is a bit shameless, but heck, you write a book, you want people to read it. 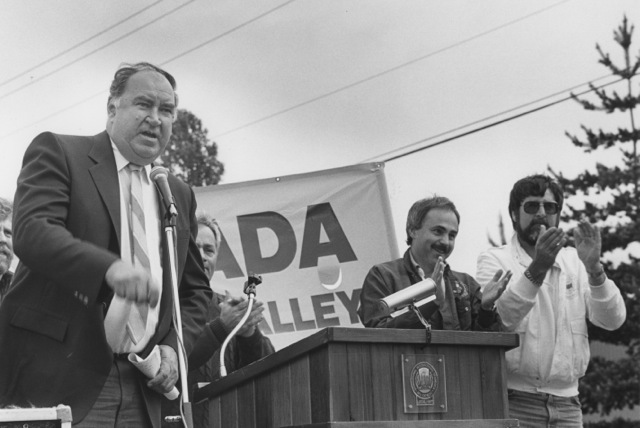 So it is with The Art of the Impossible, the rollicking saga of B.C.’s first ‘socialist’ government (NDP-ers used the word proudly in them there days…), under the sometimes wild, sometimes wonderful and always larger-than-life leadership of Dave Barrett. Today, we have a government that can’t even bother holding a fall session of the legislature, the only province in Canada with that dubious distinction. At least there’s no need for a Christmas break, since the legislature has been mothballed since the spring. (“Passing laws is so hard…”). I mention this only because it is such a contrast to the frenzied, non-stop activity of the Barrett government. In just 39 short months, the NDP passed an astonishing 367 bills, an unprecedented pace of more than two a week. And much of the legislation was transformative, radically changing British Columbia from the bizarre backwater it was under W.A.C. Bennett, despite all those roads, dams and bridges, to a modern, progressive province. Many of the legacies of the Barrett government are with us still. Of course, Barrett was far from perfect. He made mistakes that hurt him and his government. The Art of the Impossible doesn’t shy from detailing them. It’s a warts-and-all tale. What I and my old journalist buddy, co-author Geoff Meggs, set out to do was to bring that exciting, colourful era to life, and give substance to a chapter of B.C. history that most previous chroniclers had dismissed as some sort of disastrous blip. It was far from that. There’s never been a government like it. Anyway, it’s Christmas, folks. So, if you’re short a last-minute gift for someone who hasn’t yet read it, who has any interest at all in politics or B.C. 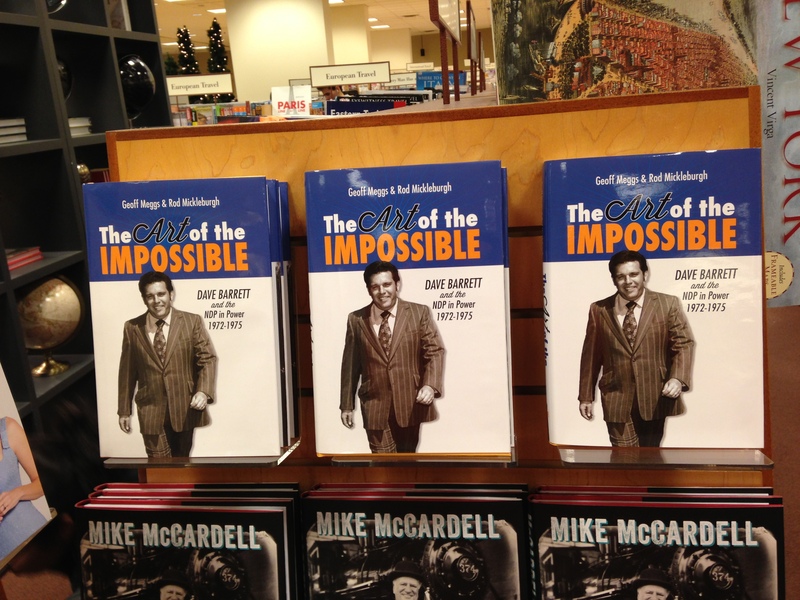 history or just a good read, full of unforgettable characters and events, why not pick up a copy of The Art of the Impossible? Our yarn won the Hubert Evans Prize at the B.C. Book Awards earlier this year for the province’s top non-fiction book in 2012. I would also add that this book, now in its second printing, has been enjoyed by readers of all political stripes. Here are some reviews. By the end of the book, see if you agree with me that there is an eerie similarity between the so-called Chicken and Egg War that heavily damaged Dave Barrett’s credibility and the current Senate scandal that has embroiled Prime Minister Stephen Harper. Writing an obituary on Jack Munro isn’t easy. For one thing, it’s hard to get it out of your head that such a dominant, larger-than-life, one-of-a-kind character has really left us. Secondly, of course, as Jack might have said, there’s just too much goddamned material. 1,800 words really can’t do justice to someone who presided over the news in this province for 30 years, when labour mattered. My effort for the Globe and Mail is here. There was much that didn’t make the cut. Here are a couple of anecdotes from the good old days. At the exceedingly bitter B.C. 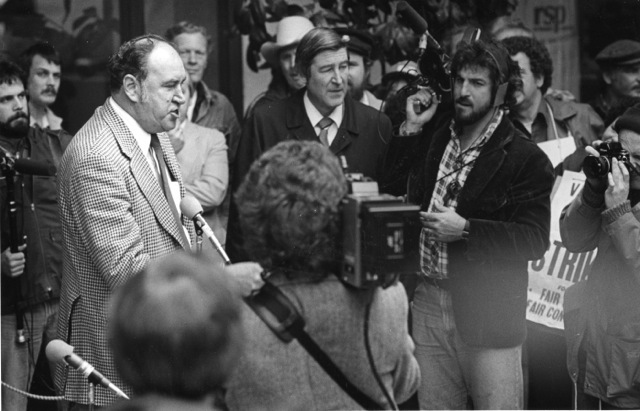 Federation of Labour convention in 1976, forces headed by Munro were trying to unseat the incumbent Fed leadership, under secretary-treasurer Len Guy and president George Johnston. On the convention floor, Munro raised a point of order, complaining that he was being forced to wait so long for his turn to speak that he might have to take a piss right there. Johnston, who was chairing the convention, replied: “Piss away, brother Munro. Piss away.” Even Munro had to laugh. There was also his still-remembered birthday tribute to then Prime Minister Trudeau. Munro had all the delegates at an IWA convention stand and sing ‘happy birthday’ to the PM, each with a single finger raised in salute. 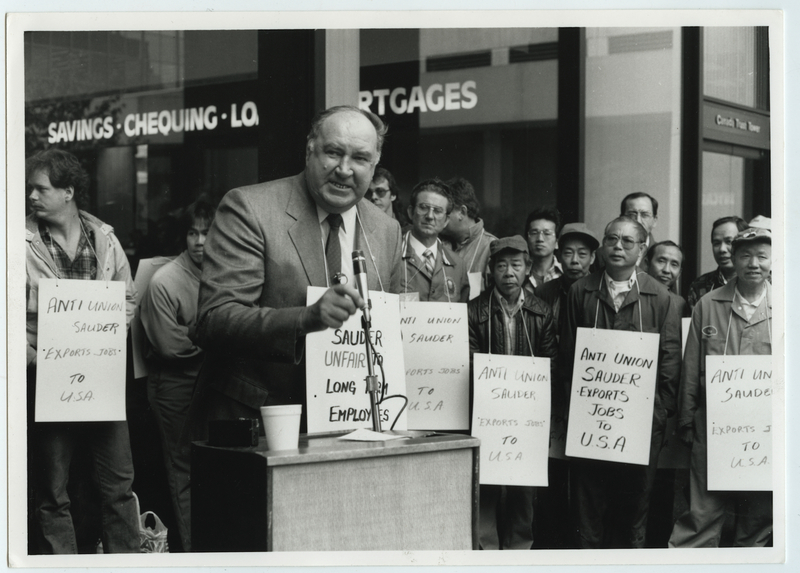 And Jack, himself, just before Labour Day: “The labour movement is having a tough time. Everybody’s struggling. We’ve lost some really important values. Workers are such an important part of our society, our way of life, social consciousness, social change. Too many people have forgotten that. We’re not headed up, we’re headed down. On Jack Munro’s last night, Deborrah had the Canucks game on, as the big fella drifted in and out of consciousness. He missed the home team blowing another third period lead. When she told him what happened, Munro whispered: “Oh, those bloody Canucks.” They were his final words. I’m not much of a TV guy, unless its news, sports, or old movies. Something sticks in the craw, too, about giving even more money to the cable company for HBO, and so on. But long after the raves had stopped for all fives seasons of The Wire, my household came into temporary possession of the DVD set, and yes, just like everyone else, I became totally hooked on David Simon’s brilliant depiction of the seamy side of Baltimore, and the unforgettable characters on both sides of the law who roamed its mean streets. 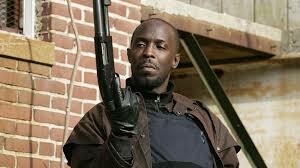 Omar, Stringer Bell, Dee, Bubbles, Lt. Daniels, and so on. Simon, who spent 12 formative years on the Baltimore Sun newspaper, went on to create the celebrated Treme, about post-Katrina New Orleans. Meanwhile, outside the creative bubble, the more he has looked at his country, the more Simon has become distressed at the loss of the relatively progressive forces that once drove its economy, that created the richest land on earth. Capitalism has lost its way. Greed and individualism have triumphed, with a diminishing safety net for the losers left behind. Simon’s anguish recently spilled out in an inspired, angry speech at the Festival of Dangerous Ideas in Sydney, Australia. An edited version of his outburst appeared in The Guardian and has been widely-circulated on social media. But I think it’s worth repeating here, for those who may have missed it. Even if you have read it before, I recommend another go. Simon’s fiery dissection of American society is even better the second time. Of course, to think that what’s happening to the south of us is not working its way into Canada would be foolish. 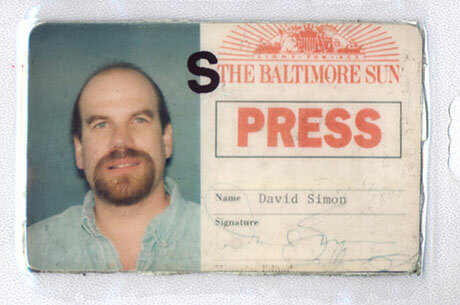 Take it away, David Simon, who feels compelled to stress that he’s hardly a socialist, merely someone convinced that our current economic system has gone off the rails. Click below to read it all. 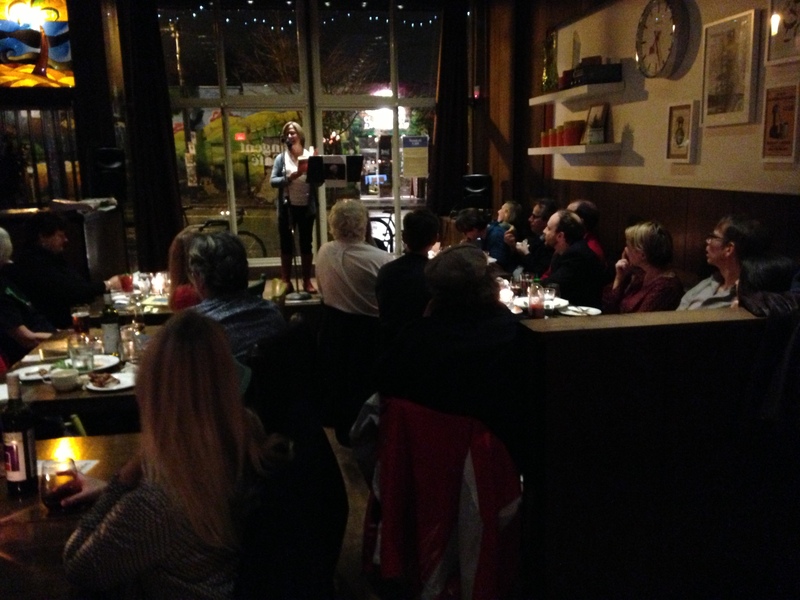 Munro’s Books, our appreciation night at the Tangent Café for Canada’s beloved Nobel Prize laureate, was a delightful evening. There were heartfelt readings from favoured short stories by members of the city’s diverse writing community. For me at least, hearing her immaculate sentences read out loud added even more to Alice Munro’s wondrous ability to draw one in with just a few, memorable paragraphs. It made me want to re-read all her stories, and catch up on the ones I’ve missed. I also found it interesting that most of the selections were from collections of some years ago. I’m not sure that was because the readers felt her later work was not quite as good, or whether it was the fact they were younger and maybe just starting out in the writing game, when they first encountered those wonderful, early short stories. Likely the latter. Nothing resonates so much as discovering great literature when one is young. It stays with you forever. There were also some lovely anecdotes. Perhaps the best was told by novelist/forest company president/columnist Anne Giardini. One of five children of the late, great author Carol Shields, she recalled the time when they were all just kids, creating chaos in the house, while their mom was trying to have a conversation over the phone with, yes, Alice Munro. Of course, each household had only one phone in those pioneer days, so there was no escaping the noise. Finally, in exasperation, Carol Shields told her children: “Ssshhh, it’s Alice Munro.” The phrase became a family joke for years, repeated endlessly, in that irreverent, teasing way children have with their mother. “Ssshhh, it’s Alice Munro.” Cue the gales of laughter. 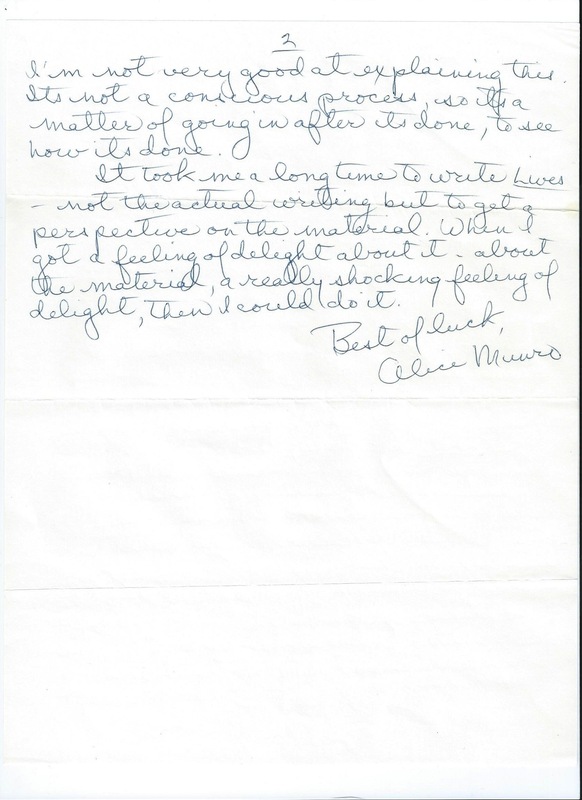 Here’s what Alice Munro wrote. I think it’s quite illuminating. Your letter delighted me. I’m always glad if Lives stands up to re-reading. When you present a book to the world, it’s not just a piece of work, but a whole attitude you present. It’s a way of seeing things and when people accept or reject it, that is really what they’re dealing with. Now, to your questions. Lives is absolutely personal, autobiographical if you like, in feeling. Most incidents in it are invented. The other people, and what happens, are invented in a way best suited to bring out what the girl feels, discovers, etc. eg, the scene at the dance-hall takes my own feeling and experience of such dances, and builds a scene to show that, using details both invented and remembered. It doesn’t matter what’s ‘real’ then. It’s what ‘works’. Do you see? I’m not very good at explaining this. It’s not a conscious process, so it’s a matter of going in after it’s done, to see how it’s done. It took me a long time to write Lives – not the actual writing, but to get a perspective on the material. When I got a feeling of delight about it – about the material, a really shocking feeling of delight, then I could do it. Thanks to the Globe’s Marsha Lederman, who provides the best regular arts coverage in the city, for rising from her sick bed to host, and to freelancer extraordinaire Kerry Gold, for getting the whole thing going. And thanks, as well, to participants Caroline Adderson, Tom Scholte, Anne Giardini, Cynthia Flood, Shaena Lambert, Anakana Schofield, Hal Wake, Sandy Garossino and Aislinn Hunter. Kudso as well to the good folks at the Tangent Café, for providing such a warm, comfortable setting. As the evening wound down, I asked the manager how sales had been. “We’ve never sold so much wine,” he replied. As a bonus, here’s the New Yorker’s take on Alice Munro’s “living room acceptance” of the Nobel Prize.